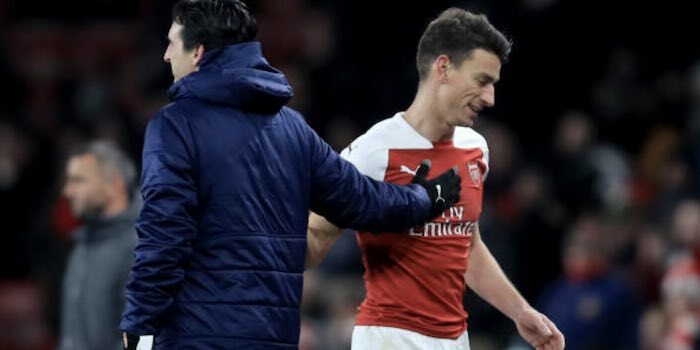 Unai Emery has expressed his joy at the form of Laurent Koscielny who received Sky’s Man of the Match award for his goal-scoring and stellar defensive performance in the 2-0 win against Chelsea last time out. Many doubted the 33-year-old would be able to perform at the highest level after suffering such a horrific achilles injury, but the Arsenal skipper has impressed the boss in recent weeks. Speaking ahead of Friday’s FA Cup clash with Manchester United, the Spaniard noted, “In the last matches, I think we are looking at a Koscielny with a big performance like he is used to producing. “After these injuries, it’s also necessary to take matches, to take confidence again and then physically, for him to be well enough to play with this level of performance. Koscielny, who spoke of his devastation at missing France’s victorious World Cup campaign, returned to action in December, with both a new haircut and the captain’s armband. After initially struggling in games against Southampton and Brighton, he seems to be back to his best. Great stuff. So good to his delight when he scored. The Boss is Back. Long live the Boss! With all the talk of Ramsey’s legacy and whether he’ll be considered a “legend” or not, I’d put Kos in that same category. He’s been a leader on the team for years. Doesn’t want the spotlight, is the consummate team player. Love Kos and we’d be lucky to get a CB half as good as him. Drop him for the FA cup and Europa League up until the final, keeping him fresh for the PL. Kos the Boss looks fitter and tanned from all that tough summer training that he went through. If Lolo continues his good form, hopefully he can captain us to a top 4 spot. Happy for him. He did very well against Chelsea. He has been regaining a bit of match sharpness. We will need Mustafi, Sokratis and Koscielny through to end of season. Mavropanos is largely untested so I would not rely on him. Any positives from him is a bonus. BUT the 3 senior Cbacks will have to rotate through either a back 4 or hold ina aback 5. Koscielny will not last through the season physically otherwise. And we cannot be absolute and think that one size fits all. There will be times we may need to go to a back 3. It all depends on the opponents and the situation we may face with injuries as well. The common mistake by most fans is to assume there is only one preferred way of playing. Why should there be??? The whole idea and purpose of Emery is to have options and use them to suit the situation. Only 4.3m to sign Gelson Martins on loan according to Newcastle who are in for him. Yet we as Arsenal FC can’t find the money and have to resort to non committal loans. Its a dismal state of affairs not least perpetuated by the ownership but also compounded by poor management of the Transfer team. Some rumbling about us trying our luck with James Rodriguez on loan at Bayern. He has been a largely unsettled figure for some seasons now. If he does come in it means Ramsey will be allowed to leave early which merely means we are replacing not adding. Is our transfer situation better than when Wenger was in charge? You’re having a laugh if you truly think so. I really am hoping Kos continues to do well this year but in the summer we desperately need another solid CB that is young but will still improve our defense. Any chance we can spend big on Matthijs de Ligt in the summer!?! ?